Eyeteeth: Incisive ideas: In the age of derivatives, reasserting an original: John Yang's "Blindman's Bluff"
In the age of derivatives, reasserting an original: John Yang's "Blindman's Bluff"
Sometimes in the life of images, derivatives end up eclipsing the original, leaving creators of unique works unacknowledged -- and, often, unpaid -- for their creative endeavors, even as spinoffs of their art zoom around the globe. 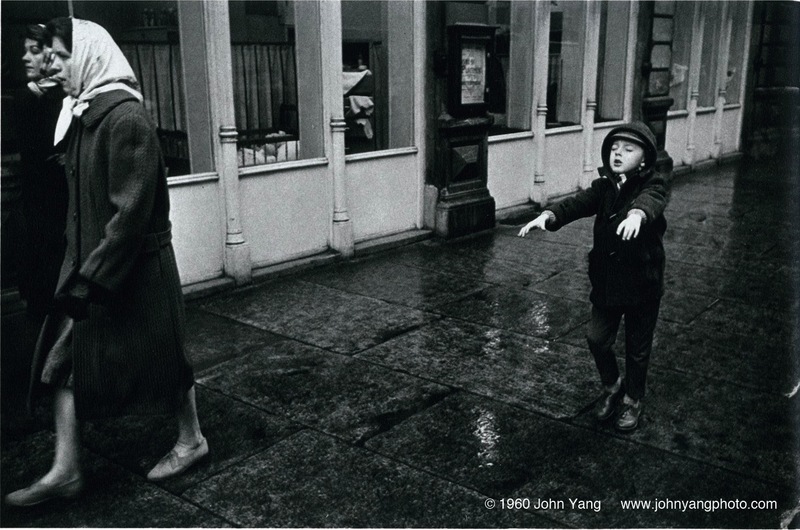 And that's the case with a 1960 photo by the late John Yang called Blindman's Bluff. 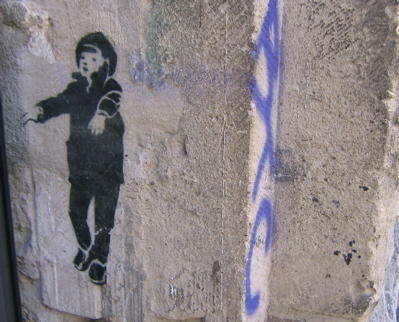 The first time I saw a version of Yang's photo of a sleepwalking boy was in 2005 when I spotted a stencil rendering of it outside an art squat in Berlin. I quickly learned that it was an "adaption" [sic] of Yang's photo, used to promote the Icelandic band Sigur Ros' album ( ). I forgot about the image until I noticed another stencil version of it on a boxcar in Minneapolis earlier this month. It's showed up in Reykjavík, Melbourne and elsewhere -- likely by artists who know little, if anything, about the original. Determined to figure out the back story of this arresting image, I contacted the estate of Yang, who passed away in September 2009. The reply I got back from his daughter was both beautiful and disconcerting. Born in Suchow, China in 1933, Yang emigrated first to the UK with his family, then, when he was six, to the United States. A U.S. citizen living in New York, he attended Harvard where he got his philosophy degree, then went on to architecture school at the University of Pennsylvania before being drafted into the military. Stationed in Germany, he played cello in the 7th Army Symphony and performed throughout Europe, according to his daughter, Naomi Yang, herself an artist (graphic design) and musician (Galaxie 500). It was in Strasbourg, France, just across the border from Germany, where he encountered the iconic sleepwalker: "The photo was not posed, my father was taking street scenes at the time and happened upon the boy," Naomi writes in an email. John Yang later focused his lens closely on details of urban life, including ornamental stonework on the facades of New York brownstones and memorial photographs on headstones at an Orthodox Jewish cemetery in Queens, but at the time he shot Blindman's Bluff, he took a broader view, shooting documentary-style streetscapes. The photo was reproduced in the Time/Life book Photographing Children, which Naomi surmises, is where Sigur Ros found it -- and took it. Upon seeing the graffiti version of her father's work, Naomi wrote, "Wow, that image really gets around." Could be. Someone once said that my pictures have a distinctive elegiac tone, that they are pictures taken in a minor key. For more on John Yang, visit johnyangphoto.com. A moving story, Paul, a thousand thanks for this. I should add that some may claim the use of the source image should be considered fair use, but given that the stencil appeared on packaging for an item for sale, it seems doubtful the band would have a good case if sued for copyright infringement. The case of Shepard Fairey selling Obama/HOPE posters based on an AP photographer's work is a good example of how that could go down. Also, you're welcome, Erik, and thanks for the note! Great story - but how SLEAZY of Sigur Ros. Yes, they used the image for marketing. That's not fair use by any definition. They owe the estate. Grrr. Shame, shame, shame on you Paul for not researching all of the details before posting this. Or should I just congratulate you for being a typical one sided journalist. Have courage, Anonymous: provide details to back your insult, and use your real name. Let's see: You seem to get the bio of the artist right, you attributed the claim about Sigur Ros' possible copyright infringement to Naomi Yang, you credited all photos. Can't see what the problem is with Anony-mouse. Probably some fan, or maybe the band's manager, who can't believe Sigur Ros might've neglected to respect another artist. Your one error, Paul: Feeding the trolls. Shame shame on Anonymous for the drive-by smear. Seems like Eyeteeth did due diligence. It's the yellow-bellied Anonymous, who offers no actual facts, who's being one-sided.